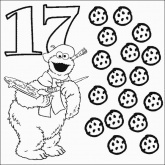 17 cookies coloring pages, the monster painted 17 cookies on the image, which color you want paint its? 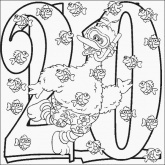 this is a free coloring pages, download for free! 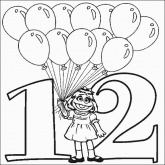 Number 17 Coloring Pages. Number 17 with Cookie Monster and seventeen Cookies. 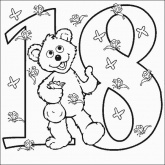 look the little baby bear stand in the front of number eighteen. look she's happy! it's free printable, download and print it for free. 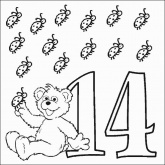 do you like our little baby bear number coloring page? enjoy! download free printable from here! 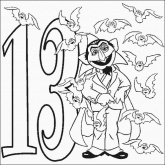 hehe~ here is vampire and 13 bats coloring page, do you like vampire coloring pages? do you like bats coloring pages? 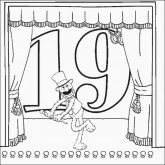 or this 13 bats! 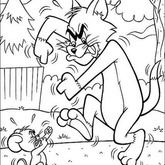 the coloring page could use for Halloween, you want scare away people? use it! ah, paint it at first! 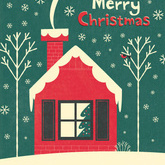 Free Printable just at printfree.cn! download and print it for free,love it! 15 pan cake coloring page, do you like eat pancake? or like this monster? download it for free! you may follow the link bloew the content! Hey tally and apples are there! 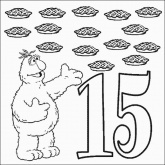 look the 16 apples, happy numbers! you make paint its colors, 16 differents apples or 4x4 apples! 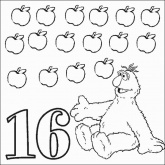 as you wish!Hope you like it, enjot printfree.cn!like this telly 16 number apples coloring page. 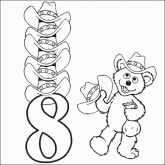 coloring pages and free printable for kids!